Some bands turn into shorthand for a certain sound or style, and Pink Floyd belongs among that elite group. The very name connotes something specific: an elastic, echoing, mind-bending sound that evokes the chasms of space. Pink Floyd grounded that limitless sound with exacting explorations of mundane matters of ego, mind, memory, and heart, touching upon madness, alienation, narcissism, and society on their concept albums of the '70s. Of these concept albums, Dark Side of the Moon resonated strongest, earning new audiences year after year, decade after decade, and its longevity makes sense. That 1973 album distilled the wild psychedelia of their early years -- that brief, heady period when they were fronted by Syd Barrett -- into a slow, sculpted, widescreen epic masterminded by Roger Waters, the bassist who was the band's de facto leader in the '70s. Waters fueled the band's golden years, conceiving such epics as Wish You Were Here and The Wall, but the band survived his departure in the '80s, with guitarist David Gilmour stepping to the forefront on A Momentary Lapse of Reason and The Division Bell. Throughout the years, drummer Nick Mason and keyboardist Rick Wright appeared in some capacity, and the band's sonic signature was always evident: a wide, expansive sound that was instantly recognizable as their own, yet was adopted by all manner of bands, from guitar-worshiping metalheads to freaky, hippie, ambient electronic duos. Unlike almost any of their peers, Pink Floyd played to both sides of the aisle: they were rooted in the blues but their heart belonged to the future, a dichotomy that made them a quintessentially modern 20th century band. That blues influence, quickly sublimated and only surfacing on the occasional Gilmour guitar solo, was the foundation for the band's very name, as the group decided to splice the names of two old bluesmen -- Pink Anderson and Floyd Council -- as a tribute to the American music they loved. These members of the early Floyd -- guitarist/singer Syd Barrett, bassist Roger Waters, keyboardist Rick Wright, and drummer Nick Mason -- were all architecture students at London Polytechnic, with the exception of Barrett, who was an art student and a friend of Waters since childhood. This version of the band started gigging regularly in 1965, with Barrett becoming the group's lead singer quite quickly. During this time, the group relied on blues and R&B covers, not unlike many of their British peers, but they wound up extending the time of their sets through extended instrumental jams, planting the seeds of space rock that would come to fruition not much later. In 1966, the group's increasingly adventurous sets became something of a sensation in the London underground, leading to a contract with EMI early in 1967. Their first single, "Arnold Layne," backed with "Candy and a Currant Bun," appeared in March of 1967, and it was banned from some radio stations due to its gender-bending lyrics, but the single wound up in the U.K. Top 20, and the group's second single, "See Emily Play" -- a menacing, mincing stomp with a profound, lasting influence -- went into the Top Ten, paving the way for the release of The Piper at the Gates of Dawn. On their full-length LP, Pink Floyd veered toward the experimental and avant-garde, particularly on the elastic, largely instrumental vamps "Astronomy Domine" and "Interstellar Overdrive," resulting in an album that had a significant influence not only upon its release but well beyond. It was also a hit in the U.K., reaching number six on the British charts. This was a sudden rush to stardom and complications arose nearly as quickly. Not long after the release of Piper, Barrett began showing clear signs of mental illness, to the point he would often freeze on-stage, not playing a note. At this point, David Gilmour -- a friend and associate of the band -- was brought in as a second guitarist, with the intention that he'd buttress the group's live performances while Barrett continued to write and record new material. This soon proved to be an impossible situation, and Barrett left the group, at which point the band's management also jumped ship, leaving them without any kind of leader. In the wake of Barrett's departure, the remaining members of Pink Floyd developed a different musical identity, one that was expansive and eerie, characterized by the band's spacy, somber explorations and, eventually, Waters' cutting, sardonic lyrics. This transition took some time. 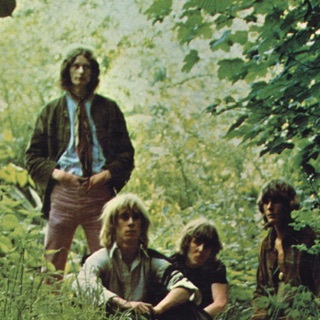 In 1968, they released A Saucerful of Secrets, which contained Barrett's final composition for the group, "Jugband Blues," and it found the group moving forward, particularly on the instrumental sections. A Saucerful of Secrets also saw the group begin a long, fruitful collaboration with Storm Thorgerson's design team Hipgnosis; they'd wind up designing many iconic album covers for the band, including Dark Side of the Moon and Wish You Were Here. Hipgnosis emphasized album art, and albums are where Pink Floyd concentrated from this point forward. After the soundtrack to More, the group moved to EMI's progressive rock imprint Harvest and became the label's flagship artist beginning with the 1969 double-LP Ummagumma. Divided between live performances and experimental compositions from each member, the record wound up in the Top Ten in Britain and sowed the seeds of a cult following in the United States. Pink Floyd's next album, Atom Heart Mother, featured extensive contributions from composer Ron Geesin and wound up as the band's first number one album in the U.K. 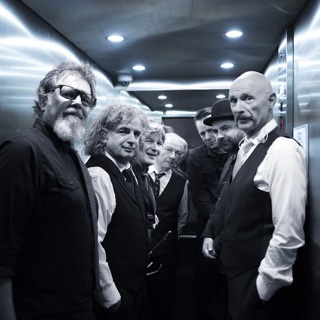 The band embarked on an extensive supporting tour for the album and when they returned they delved even further into studio experimentation, learning the contours of the studio. 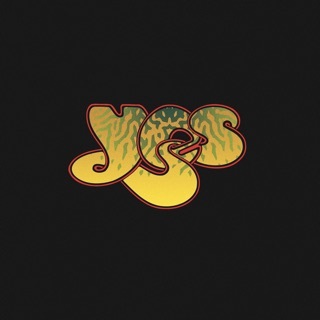 Their next studio album, 1971's Meddle, bore the fruit of this labor, as did 1972's Obscured by Clouds, which was effectively a soundtrack to Barbet Schroeder's film La Vallee. All the experiments of the early '70s were consolidated on their 1973 album Dark Side of the Moon, an album for which there simply was no precedent in their catalog. Deepening their music while sharpening their songwriting, Floyd created a complex, luxurious album with infinite space and depth. Partially helped by the single "Money," it was an immediate success, reaching number one on the U.S. Billboard charts and peaking at number two in the U.K., but what was striking was its longevity. Dark Side of the Moon found space on the Billboard charts and then it just stayed there, week after week for years -- a total of 741 weeks in all (once it finally dropped off the charts, Billboard began the Catalog charts, where Dark Side was a fixture as well). Dark Side of the Moon was a staple on classic rock radio but it also was a rite of passage, an album passed down to teenagers when they were turning to serious music, and it was an album that stayed with listeners as they aged. Now established superstars, Pink Floyd dug deep on Wish You Were Here, their 1975 sequel to Dark Side of the Moon, which functioned as an album-long tribute to Syd Barrett. Compared to Dark Side, Wish You Were Here wasn't quite a blockbuster but it was certainly a hit, debuting at number one in the U.K. and reaching that peak in the U.S. as well. Floyd continued to tour steadily, often working out new material on the road. This is particularly true of 1977's Animals, which had its roots in several songs aired during the 1975 tour. During the Animals tour, Waters had a difficult experience with a Montreal crowd where he spit on a heckler, and he used this incident as the genesis for 1979's rock opera The Wall. Co-produced by Bob Ezrin, The Wall may be Floyd's most ambitious album, telling a semi-autobiographical story about a damaged rock star, and it's one of the band's most successful records, topping the charts throughout the '80s and turning into a pop music perennial along the lines of Dark Side. Part of its success in 1980 was due to "Another Brick in the Wall, Pt. 2," where an instrumental motif from the album was given a disco beat and an anti-authoritarian spin, leading to a genuine number one hit single from the band. Certainly, the single had more to do with the album's success than the live production of the album, as Pink Floyd only did a handful of dates in major cities. 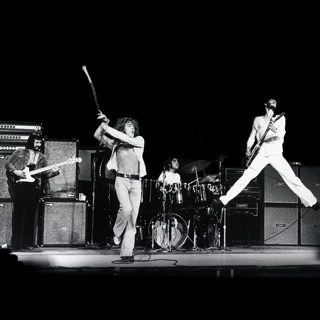 Nevertheless, these shows, consisting of a wall being built across the stage during the first act and the band performing behind it during the second, were legendary (Waters would revive and update the production years later to great success). Pink Floyd did attempt to film The Wall for a documentary film, but the footage was botched, so they decided to pursue a feature film directed by Alan Parker and featuring Boomtown Rat Bob Geldof in the lead role. The Wall arrived in theaters in 1982 and turned into a midnight movie staple. A year later, The Final Cut -- a further autobiographical work from Waters, its title a sly dig to his battles with Parker on the film -- arrived, but it didn't come close to matching the chart success of any of its predecessors. Behind the scenes, things were tense. Rick Wright had been fired during the making of The Wall -- he was hired as a contract player during the recording and tour -- and Waters split after the release of The Final Cut, assuming that it was the end of the band. Waters released his debut solo album, The Pros and Cons of Hitchhiking -- a piece that was pitched to Floyd in 1978, but the band chose The Wall instead -- in 1984, and not long afterward, Gilmour and Mason indicated they intended to carry on as Pink Floyd, so the bassist sued the duo for the rights to the Pink Floyd name. Waters lost and Pink Floyd released A Momentary Lapse of Reason in 1987, just months after Waters released his own Radio KAOS. Bad blood was evident -- T-shirts on Waters' tour bore the question, "Which One's Pink?," an old lyric that now had greater resonance -- but Pink Floyd emerged victorious, as A Momentary Lapse of Reason turned into an international hit, and racked up some hit singles, including "Learning to Fly," which was supported by the band's first music video. Most importantly, the band racked up significant box office returns on tour, playing to sold-out stadiums across the globe. This tour was documented on the Delicate Sound of Thunder live album. The success of A Momentary Lapse of Reason allowed Pink Floyd to dictate their own schedule and they took their time to return with a new album, eventually emerging in 1994 with The Division Bell. Greeted by warmer reviews than its predecessor, The Division Bell was another international success, and the accompanying tour -- which featured a performance of the entirety of The Dark Side of the Moon -- was a smash success. As before, the tour was documented with a live album -- this one was called Pulse, packaged in eye-catching artwork with a pulsing LED light -- and it performed respectably. After that, Pink Floyd went into effective retirement. 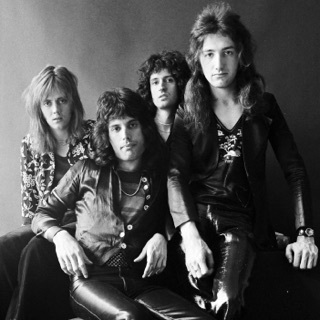 The group was inducted into the Rock and Roll Hall of Fame in 1996, while Gilmour released some solo albums, including the acclaimed On an Island, but most of their efforts were devoted to managing their catalog. Long a beloved band of audiophiles, Floyd saw their catalog boxed and remastered several times, including 5.1 mixes on SACD in the early 2000s. As the new millennium progressed, a détente arose between the Floyd and Waters camps, culminating in an unexpected reunion of the original lineup of Waters, Gilmour, Mason, and Wright at the 2005 charity concert Live 8. The reunion was a rousing success, sparking rumors of a more permanent arrangement, but Gilmour declined. Instead, Waters ramped up his touring -- he performed Dark Side in its entirety, then turned his attention to The Wall, touring that for years. Gilmour and Mason wound up appearing at a 2011 show in London, signaling that there was no ill will between the members. Barrett passed in 2006 from cancer and, in 2008, Wright also died from the disease.